ScreenSteps Desktop 2.9 and Workgroup DocumentationScreenSteps Desktop & WorkgroupCustomizing HTML Templates OverviewWhat is an HTML Template? 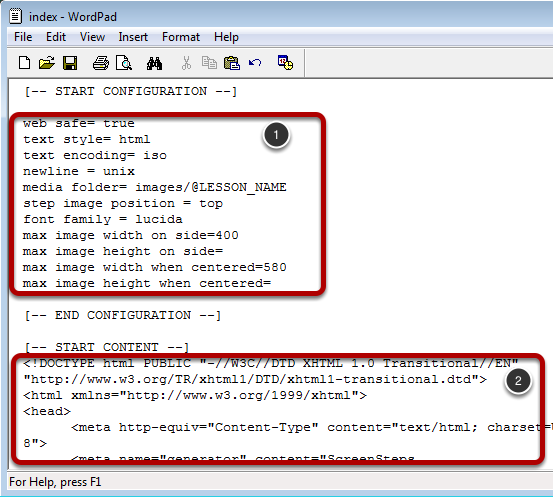 An HTML template is a folder that contains a template file that ScreenSteps will parse and use to format lesson and manual output when using the Export to HTML feature. In addition the folder can contain any number of supporting files or folders. Although we use the name HTML templates you are by no means limited to HTML output. Templates can be customized to export any text-based output. This means you can create your XML templates and import lessons created in ScreenSteps into content management systems. This is an example of the Red lesson template that is include with ScreenSteps. It consists of one file and 3 folders. 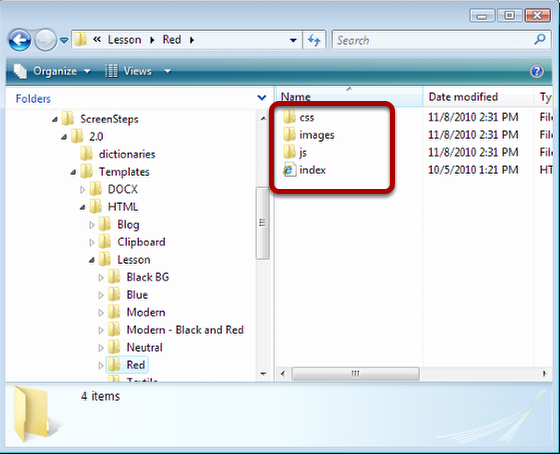 index.html is the template file used to generate the lesson when exporting from ScreenSteps. If you open index.html in a text editor you will see that it is just a text file that contains instructions for ScreenSteps. At the top of a template file you configure template properties (1). Later on in the template file you specify how to format the output (2). This is an example of what the output from the Red lesson template would look like. Notice that index.html has been replaced by the lesson title (1). The three folder were copied over and placed in the output folder (2). Because the media folder template property was set to 'images/@LESSON_NAME', the lesson images were placed in the images folder.